You are currently browsing the tag archive for the ‘pistachios’ tag. I bet you thought I’d completely abandoned this project, right? Right? Wrong, darlings. But I do work in the vegan goodies business, and the holiday season tends to be rathah bizzay, as I’m sure you can imagine. This installment is all about the cool cherry cream. It’s really a sort of vegan mousse. I had planned on using frozen cherries I’d stashed away back in the summer, but those were hijacked for the trifle I put together for family and friends on Christmas Day. So I was reduced to using a can of bing cherries bought from the supermarket. They weren’t organic, and they were packed in a mixture of their own juice and corn syrup. Had I been using pitted, fresh or frozen cherries, I would have made my own syrup with them, which is what I recommend you do. I’ll include a little note at the end telling you how to do this. It’s quite simple, really; which is an adequate descriptor for the remainder of this recipe, actually. Mix cherry liquid, sugar, agar and salt together in a small saucepan, and bring to a low boil, whisking all the while, until the sugar is completely dissolved. Remove from heat and let cool slightly. Place the vegan “cream cheese” in a mixing bowl and beat with an electric mixer until smooth and fluffy. Add in the pureed tofu and mix. With the beaters still working, slowly add the cherry syrup until it is completely incorporated and you have a nice pink creamy mixture. Refrigerate this for an hour, stirring occassionally, until it has thickened. Add the vanilla extract. Take the electric beaters to it a second time, on high speed, to incorporate as much air as possible into the mixture. Gently fold in the reserved cherries, keeping four aside as garnish. Spoon the mousse into 4 serving dishes. Top with a cherry and toasted, crushed pistachios, if desired. Keep chilled until ready to serve. Place 2 cups of fresh or frozen cherries in a saucepan with 4 tbsp each water and liquid sweetener (maple syrup, corn syrup, brown rice syrup, agave nectar). Bring to a low boil and cook, uncovered, until the cherries release their juice. Let cool. 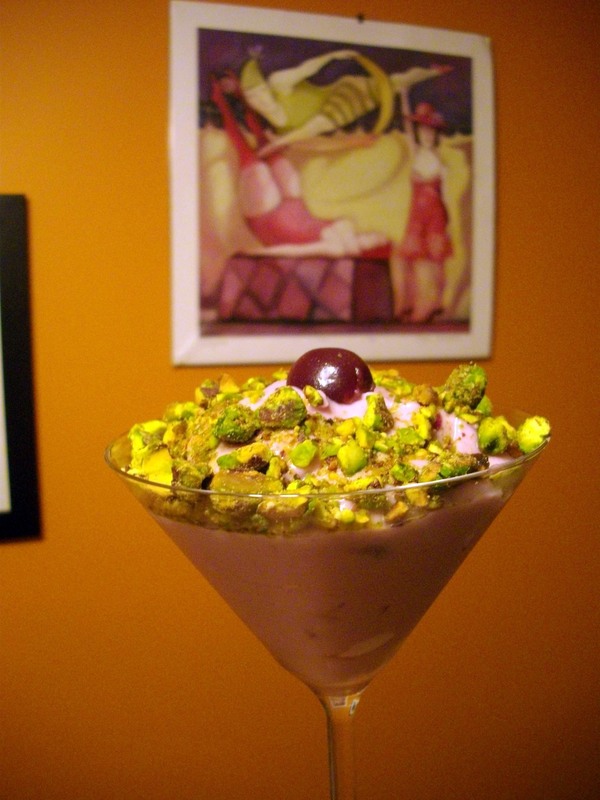 This mousse was a HUGE hit with the family, and I loved it because it was so simple to prepare. Montelimar: A Place in France, Where They Make Nougat. I admit, it isn’t in the least bit rational, but all of my life I have avoided eating nougat, or anything that claimed to contain nougat. It’s the word…it just sounds so UGLY to me. Newwwwww-gat. It causes one to shudder. It didn’t matter how many times I heard how delicious it was or how many people insisted I try it, I steadfastly refused out of sheer stubbornness. It was childish and closed-minded and absolutely ridiculous and I knew I was being a poo. I still would not let nougat (shudder) pass my lips. And so after I did a little research into what George Harrison was singing about when he sang “Montaelimar,” in his totally adorable nasal accent you can imagine how dreadful I felt when I discovered Montelimar is a place in France, famous for it’s nougat (shudder). Interesting to note is that unless a nougat is actually produced in Montelimar, and it contains certain specific percentages of almonds and lavender honey, it can’t actually legally be called Montelimar nougat. Much like only sparkling wines made from the grapes of the Champagne region can be called Champagne. Oh, those proprietary French. The history of nougat is long…dating back to Ancient Egypt and Greece, where it was common to make sweets from honey and nuts. The almond tree was imported to France from Asia during the 17th century and thus replaced other nuts in the “nux gatom” (nut cake) or “nugo”. This treat was generally brown in colour and rather crunchy. Sometime around 1650 or so they began producing a softer, white nougat (shudder) by incorporating egg whites into the mixture. Now, as you know, and I know, vegans don’t eat honey and we certainly don’t eat eggs, so the challenge I faced with creating this particular Beatles-themed treat was triple fold. Replace the honey, replace the eggs, and make something that I instinctively find repulsive. Greeeeeat. However, I gritted my teeth, and got down to work, because you can call me a procrastinator and you can call me close-minded but you cannot, simply cannot, call me a quitter. And you know what? I’m glad I did it. I admit that it is yummy, okay? I admit that nougat (shudder) is tasty, yummy, sweet, nutty goodness. But I still think it’s poorly named. Now it’s time for the secret confessions of the recipe. I wasn’t exactly sure how to replace the eggs. Having never actually eaten nougat (shudder) before I didn’t know what the eggs would provide to the recipe in terms of flavour or texture. I knew from the reading I did that Montelimar nougat was supposed to be chewy but firm. I understand enough about candy-making to know that whatever temperature you cook your sugar mixture at determines how firm the resultant candy is, but clearly the eggs had some role to play. Also, since the hot sugar is poured into the whipped egg whites in the original recipe, I understood that the egg whites would likely cook in the bowl, as the hot sugar was incorporated. I tossed around a few ideas but finally decided to try melting down some vegan marshmallows to replace the eggs. Next time, I am going to use a mixture of tapioca starch and water, though. And I’m also going to reduce the cooking temperature and time on the sugar syrup. Because while my nougat (shudder) is tasty and delicious and a wonderful treat….it’s also far crunchier than I believe Montelimar nougat (shudder) is supposed to be. 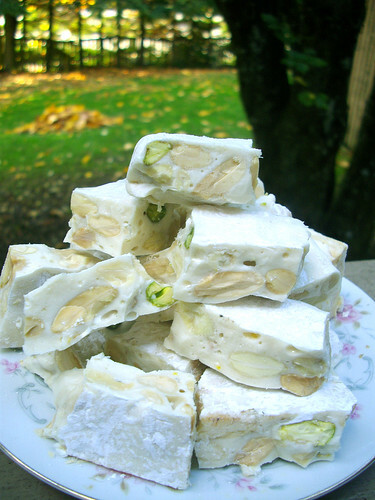 So, go ahead and follow this recipe if you like a nougat (shudder) that’s crunchy when you first bite it but then gets softer as you chew it, or try my suggestions (in brackets) if you want a nougat (shudder) that’s less firm. An egg- and honey-free version of the French classic. Delicous and sweet. Toothbrushes at the ready? Inspiration gleaned, as usual, from The Savoy Truffle, by the Beatles. Melt the marshmallows with the 2 tbsp water in a double boiler. Keep warm. If you’re using tapioca starch, do not bother with this step. Combine the sugar, agave nectar, corn syrup and water in a saucepan and bring to a boil, stirring constantly. Once this mixture boils, stop stirring and reduce heat to medium. Insert a candy thermometer and cook to 295 degrees Fahrenheit, exactly (285 F if you want a softer nougat). This can take quite a while, and the progress will seem slow until the thermometer hits about 250F, at which point it will heat very quickly. While it’s going slowly you can prepare the rest of your ingredients and work station. Have a 9 x 13″ baking sheet doused liberally with icing sugar all over the bottom. Get your stand mixer set up with it’s whisk attachment. When the thermometer hits 275F you want to put the warm, melted marshmallows into the bowl of your mixer and begin whisking. If you’re using the tapioca starch you’ll want to get it whisking at this point, too. Once the sugar mixture reaches 295 F (285 F if you want a chewier candy), immediately pour it into a heat-proof measuring cup to stop the cooking. Then begin adding it to the whipped mixture in the bowl. DO NOT POUR HOT SYRUP OVER THE MOVING WHISK, as it will simply fly all over the sides of the bowl rather than incorporating. Instead, quickly pour it into the whisked mixture by thirds, switching the mixer off with each addition, beating the syrup in completely, then adding the next third. Once all the syrup has been added, stir in the lemon zest, vanilla, and lavender oil (if desired…be careful – too much of this can ruin the batch!). Switch to the paddle attachment on your mixer and mix this on low speed for about 10 minutes, or until it’s cooled slightly. Add in the toasted almonds, chopped pistachios and salt, and mix. It will be very thick and hard to move it around the bowl as it cools, so you want to transfer it to the prepared pan as soon as you can touch it without it burning your precious little fingers. Press it into the pan to a uniform thickness. Let this cool for several hours or overnight before slicing into bite-sized squares. Store in an airtight container in a cool, dry spot for up to six months.